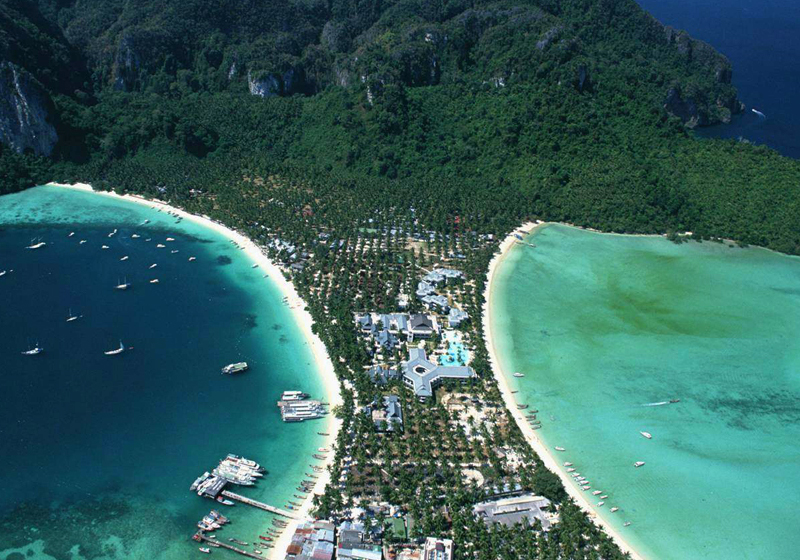 Koh Phi Phi Don is the largest of the Phi Phi Islands, in Thailand. The islands are administratively part of Krabi province. It is the only island in the group with permanent inhabitants. Like the other islands in the group, Koh Phi Phi Don is a non-volcanic island largely made of limestone. It is almost separated into two islands, but a strand of flat land connects them. On this strand lies the largest town on the island, as well as most of the resorts. Koh Phi Phi Don is now squarely on the tourist map, and tourists from all over the world (especially Europe, Japan, and the wealthier Southeast Asian countries i.e. Chinese, Singapore and Malaysia) flock to the island. Accessible from Phuket and mainland Krabi province, all tourists must arrive by Ferry. (The trip from Phuket takes around 90 minutes.) This has essentially turned the island into a rush of day trippers who overpopulate the island from 11AM-3PM. The island still holds much charm that can be enjoyed in the hours that the flocks from Phuket are not there. While in former times, Ko Phi Phi Don was a serene paradise, parts of it (especially the Ton Sai Bay area) have been exploited for tourism. Restaurants, shops, internet cafes, and shanty towns abound. Short Description: Ko Phi Phi Don is the largest of the islands in the Ko Phi Phi archipelago, in Thailand. The islands are administratively part of Krabi Province. It is the only island in the group with permanent inhabitants.